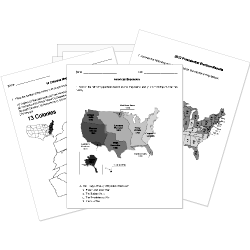 You can create printable tests and worksheets from these Grade 6 Canada questions! Select one or more questions using the checkboxes above each question. Then click the add selected questions to a test button before moving to another page. What is Canada's legislature called? Which part of Canada remained largely French culturally, though under British control? The Canadian Government sends overseas in areas affected by civil war to help civilians and provide security for elections. How does Canada's climate affect where its people live? Most Canadians live in the southern part of the country, where the weather is more moderate. Few Canadians live near the United States border, where the temperatures are too cold. Most Canadians live in rural areas, to take advantage of the country's good climate for agriculture. Most Canadians live along the Atlantic coast, where the climate is similar to the New England states. In 1608, this French explorer sailed from France to present-day Canada. Which language is mostly spoken in Quebec? Why is the Saint Lawrence River most important to Canadians? In what way has history affected Canada's government? It is model joint ring on and France's government. It abides by the laws featured in Britain's Constitution. It still has Britain's queen as its monarch. It follows the plan for government of the United States. Where are Canada's two largest cities, Toronto and Montreal, located? Which of the following supports the idea that Canada is a "cultural mosaic"? Canadians of British heritage often consider their culture the main culture of Canada. Canada encourages it's many ethnic groups to keep their traditions and languages. Canada created the territory of Nunavut for the Inuit people to govern. Canadians of French heritage often speak only French and practice French culture. How is Canada's government different from that of the United States? It has separation between its branches. It is guided by a constitution. It is a representative democracy. During its years as a Dominion, what was Canada's relationship with Britain? Britain give control to French Canadians, not British Canadians. Canada government itself, but Britain controlled Canada's foreign affairs. Canada was fully independent from Britain. Britain gave limited control to Canada but maintained control over major issues. Which of the following is a fact about Multicultural Society in Canada? New immigrants are always adaptable to new ideas. Canada's cities are among the world's most diverse. Government should not be involved and cultural issues. Being like everyone else is better than diversity. How did Canada's participation in World War 2 affect its economy? Its economy became more diversified. Its economy became dependent on agriculture. Its economy had widespread unemployment. Which sentence best explains the lasting effects of the fur trade? Trading Post for successful north of New France. Canada became a diverse country. Upper and Lower Canada were Unified. France established a colony at present day Quebec. Which of the following is an effect of immigration in Canada in the early 1900s? Canada had 5 new provinces and its land stretch to the Pacific coast. Canada welcomes immigrant farmers, which led to improved agricultural methods. Canada's economy grew and it became more diverse. Canada established itself as a world leader. The United States, Canada, and are members of NAFTA.